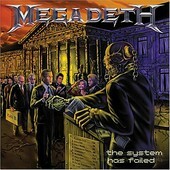 Megadeth return with a vengeance on The System Has Failed, the latest 12-track endeavor by Dave Mustaine and--a bunch of session musicians? Yes sir, Dave has cleaned house, and has ousted amongst others, original bassist Dave Ellefson, leaving Mr. Mustaine alone to stew in his sneering soliloquies. Always the resourceful fellow, Mustaine acquired the services of some heavy hitters, such as ex-Deth guitarist Chris Poland, and the results are staggering. Marking a return to the harder side of the spectrum, tracks like the pulverizing "Kick the Chair" and the old school riffaging found on the appropriately titled "Back in the Day" find the band digging through the old catalog for ideas, while "Something That I'm Not" gives Mustaine's distinctly lucid viewpoint on the Metallica vs. Megadeth grudge. Has Megadeth returned to its former glory? While there's a lot of damage to dig through (remember RISK? ), The System Has Failed finds Megadeth in fine fighting shape, and Dave hasn't sounded this intriguing, both vocally and guitar-wise, in years.